My name is Doug Thomson and Racing-Europe is my creation. I've followed racing for nearly fifty years, since childhood. I grew up in Miami during the glory days of Hialeah, and so I've been accustomed from the beginning to watching top-class horses compete before large crowds in an environment of great beauty. I've lived in New York and been a frequent visitor to Belmont. For many years I lived in Hawaii, and my "home track" was Santa Anita. Since 1999 I've lived in Charlottesville, Virginia, and I'm fortunate enough to be within reasonable range of Belmont and my favorite American racetrack, Keeneland. I go to Saratoga most summers. Since moving to Virginia, I've finally been in a place, and had the time, where I could get more directly involved with horses. Fox-hunting is my principal horse activity. I belong to the Keswick Hunt Club locally, and before Racing-Europe took over my life I tried to get out twice a week during the season. Virginia, along with Maryland and southeastern Pennsylvania, is also the home of the U.S.'s largest concentration of steeplechase and point to point racing, where the horses race not only over jumps but over courses laid out across the countryside, following the natural contours of the land. The horses may not go quite as fast as they do at Belmont or Santa Anita, but watching them run over these beautiful open fields is a fine pleasure of its own particular kind. I'd gone racing in Europe a number of times in my life, but early in the last decade I had the chance to do it in a more extensive and concentrated way. Over the course of many trips I visited all the major racetracks in England, Ireland, and France, and many in Germany and Italy as well. And I have to say: I enjoyed the racing I saw there more than any other that I'd seen in the last twenty years. Elsewhere on this website I elaborate on why I think the European racing experience is so pleasing. 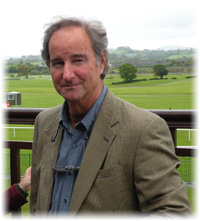 Here I will simply say that it combines all the quality, speed, and glamor of American flat racing with the spacious, beautiful environments and atmospheres I've come to value in steeplechase and point to point racing in mid-Atlantic America. I think more Americans should see racing on the other side of the Atlantic and in other parts of the world, and that is why I started Racing-Europe. I've analyzed the European racing calendar to determine the times of year when the most good racing can be fit into multi-stop trips of less than two weeks' duration. I've thoroughly examined each course and chosen exactly where we will be sitting. I've arranged for visits to training areas and farms, so we can get a behind-the-scenes look at the way things are done over there. I have inspected numerous hotels and selected the ones I think have the right combination of comfort, location, and ambiance. I've traveled extensively in my life and have used this experience to construct itineraries that will be full but not overwhelming, that will be structured but still allow you some time on your own, and that will be very comfortable without being unnecessarily glittery. I'll be accompanying each group on each trip. I'm expecting them to go smoothly, but if a problem occurs I'll be there to address it. I have a good deal of knowledge about racing in Europe, and my familiarity with our domestic sport enables me to put the European version into better context for American visitors. And if there's something I don't know, I'll make sure to find it out for us. Racing-Europe is a boutique operation, not a tour factory. When you call us, we won't have a bank of operators standing by to talk to you. But if you don't get us directly, you can be sure we will follow up with you promptly and answer any questions you might have. E-mails will be responded to quickly as well. I'm an experienced businessman and I believe we have set up Racing-Europe so that the details associated with getting you from the "interested" stage to the "sign-up" stage will go as painlessly as possible. Because of the nature of the arrangements we have to make with the racecourses on their biggest days and with the hotels at their busiest times of the year, you will have to commit and pay fully in advance — generally around two months prior to any trip's start date and sometimes earlier if circumstances require it. Insurance is available to protect you if you have last-minute emergencies that prevent you from traveling. We will of course provide personal references to any who request them. If you have anything to do with horses, there's a good chance we may have mutual friends. And our past travelers, many of whom have been out with us more than once, will also vouch for our integrity and the quality of our trips. When I am in the U.S., I will be regularly available to personally handle telephone and e-mail communications. When I am overseas, my associate will field inquiries, get information and paperwork out to you, and assist in final details. Messages will be accessed or forwarded to me on a daily basis, and I will be able to respond personally within a day or two should it be necessary. I look forward to speaking with you and sharing my enthusiasm for international horse racing. And hopefully to meeting you and showing you, in the next twelve months, some of the great race places in the world.